With over 60 years of high quality manufacturing experience, at Mentco, we carry on a proud tradition of exceptional custom machining to our customers' exact specifications. This project was for a client in the oil and gas industry who needed the stainless steel barrels shown here. 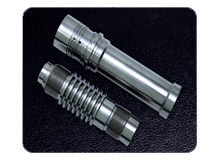 We used 17-4 Ph Stainless Steel, and employed our rod cutting and CNC turning to machine these barrels to tolerances of ±0.002". 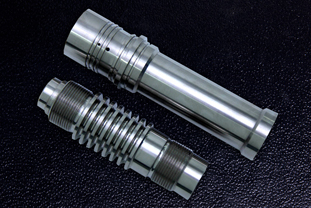 These pieces were finished using our threading, grooving, thru-hole honing, de-burring, and ultrasonic cleaning capabilities. To ensure the highest quality, each piece was put through dimensional, visual, and NDT testing. We now produce 6000 of these barrels per year for our customer in California, with the option of having them delivered just-in-time (JIT) from our San Antonio warehouse. For more information about this project, see the following picture and table, or contact us directly to speak to one of our representatives.